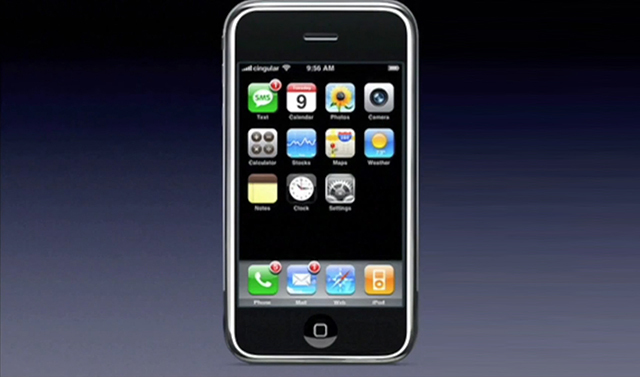 It may seem strange now, but when the iPhone originally launched (10 years today, as if you didn’t already know by now), it wasn’t viewed as a smartphone in some quarters because of restrictions placed on the device by Apple. Wireless industry analyst firm ABI Research’s definition of a smartphone was "a cellular handset using an open, commercial operating system that supports third-party applications", but Apple at that time was blocking third-party apps from the iPhone. In an interview with Newsweek’s Steven Levy, Apple CEO Steve Jobs explained the reason for the restriction, stating, "You don’t want your phone to be an open platform...Cingular doesn’t want to see their West Coast network go down because some application messed up." This restriction led ABI principal mobile broadband analyst Philip Solis to declare: "We must conclude at this point that, based on our current definition, the iPhone is not a smartphone; it is a very high-end feature phone. Sure, feature phones have third party applications too, but these are relatively weak and limited applications that work with the middleware such as Java and BREW. Applications designed for smartphones can be written to access core functionality from the OS itself, and are therefore usually more powerful and efficient. The competition in an open environment also yields more cutting edge, rich applications." ABI Research clearly wasn’t enamored with Apple’s new device, as can be seen in this withering comment from Stuart Carlaw, another analyst in the firm. Consumers will not be willing to settle for a second-rate cell phone just to have superior music. Apple must get the phone engineering part of the equation right, and it is difficult to see how they will accomplish that with no track record in the industry. Even though they are working with some prominent suppliers, the task of putting all of the building blocks together cannot be underestimated.